1. First full mechanical squonker of Lost Vape, direct full power output. 2. 9ml innovative silicone bottle system . 3. 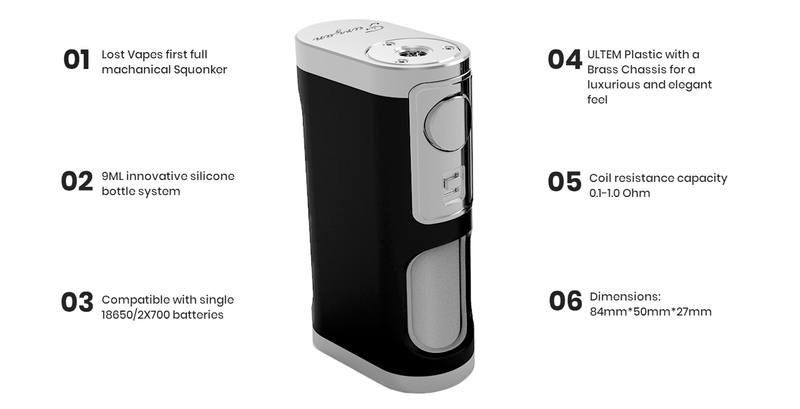 Compatible with single 18650 battery, 20700 battery and 21700 battery. 4. ULTEM with brass chassis in a unique and luxurious impression. 5. Stainless steel 510 atomizer connector with the silver-plated copper positive and negative contacts.